Did you know that YouTube is the second-largest search engine behind Google? But only 5% of small businesses use YouTube videos for marketing. That means it’s very likely your competitors are not using YouTube either, which is good news for you! But if you want to start leveraging video in your marketing strategy, you must know how to optimize your YouTube videos for local SEO. When people think about “local SEO”, optimizing their website comes to mind first. And it is definitely required if you want your local target market to find you online. If business owners aren’t implementing some kind of local SEO strategy for their business website, they’re sailing on a sinking ship. But when you combine local website SEO with optimizing YouTube videos for local SEO, you increase your chances of being found by your ideal clients. And that’s the end goal, isn’t it? Keywords play an important role in your YouTube SEO, so it’s important to think in the terms of what phrases your customers are using in their online searches. In order to successfully do this, you’ll need to understand what your customers want from your videos and how you can deliver the information via the headline. When it comes to crafting your headline, think in terms of “how to’s,” tips, and tutorials. This will immediately let your customers know that your video is of value, since it’s teaching them something relevant about your industry or solving a problem. We posted a video called “How to Wash Windows” back in 2007 and to date it has over 280,000 views and still shows up on the first page of search results. For a local carpet cleaning company, your potential clients might search for “How to clean red wine stains from carpet”, or “getting red wine out of carpet”. Or perhaps you own a nail salon, so you create a video called “Nail art design tips for beginners”. Sometimes, people want the “do-it-yourself” videos so they can save money by hiring experts. But when they find out how much time it takes, or that you need special tools to get it done right, they’d much rather hire someone to do it for them. So don’t discount showing them how to “DIY”. Ideally, your video’s headline should be under 66 characters so Google can properly display it in the SERPs (Search Engine Results Pages). For those who want to dabble in the world of keyword research, it’s important to know that Google uses a different algorithm to rank YouTube videos vs. websites. Videos take a lot of time and effort to create when done properly, so Google approaches your video content differently than written content on your small business website. You can start your keyword research by searching for industry. For example, a cleaning company may have prospects that search for a video such as “how to choose the best cleaning company” or “tips for choosing a cleaning company.” You can explore popular keywords and phrases and their data by using Google’s Keyword Planner Tool. The next step is to make sure that your YouTube videos are easily found within your local market. There are several ways to do this, and one method is to use NAP (name, address, phone number) data in your video description. Within your video description, give a brief overview about your video, and then include a call-to-action that involves your company’s location. For example, you could write a description such as: Learn all about what makes a local cleaning company in Smalltown the very best. Come visit us to learn more information at 555 Maple Drive, Smalltown, California, or give us a call at 415-323-5565. Both the address and local phone number lets YouTube know this is a local business. With these techniques, you can combine all of the necessary NAP data to make your YouTube videos rank as high as possible. Geo Tagging is about associating your video with a geographic location. So if you shot the video in your office, you can tag that video with the latitude and longitude coordinates of your office location, which helps your local SEO efforts. If you use your cell phone to shoot the video, it’s likely your built in GPS will add the geo tags to the video. Another way to add geo tags to your video is through your video editing software. You can also geo tag the video right in YouTube. Go into your video settings and click on the Advanced Settings tab. Then click on Video Location on the right side, and the map will pop up. You can then move the location marker to your location and the coordinates will show up in the search box below the map. After deciding on a title for your video, it’s time to write a good description. When it comes writing your description, you can pull information straight from your video. And as mentioned above, you can even incorporate your location into the description. Since Google gives you 5000 characters in the Description box, you might as well use as much as you can. Be sure to use your keywords in the description, much like you would when writing the description for a blog post on your website. Another option is to transcribe your video in the description box. However, if you plan on embedding your video into your website, you’ll want to avoid using the transcription on both YouTube and your local website due to duplicate content issues. My recommendation is to write a good description on the YouTube channel, and save the transcription for your website and post that under the video. One more tip on the Description box. Start with your website URL. When you add the complete URL, YouTube makes it clickable. That way, you may get some viewers clicking right over to your website without reading the entire description. You’ll also want to be sure to properly optimize your YouTube videos with “tags”, which are located under the Description box. Tags are like keywords and can include general industry terms. But you can also add geo-modified terms such as your state and city, and states or cities that you regularly target for business. Just like any other kind of content that you produce, promoting your YouTube videos on social media is key to driving traffic to your videos and website. Plan to share your YouTube video across channels such as Google+, Facebook, Twitter and LinkedIn. 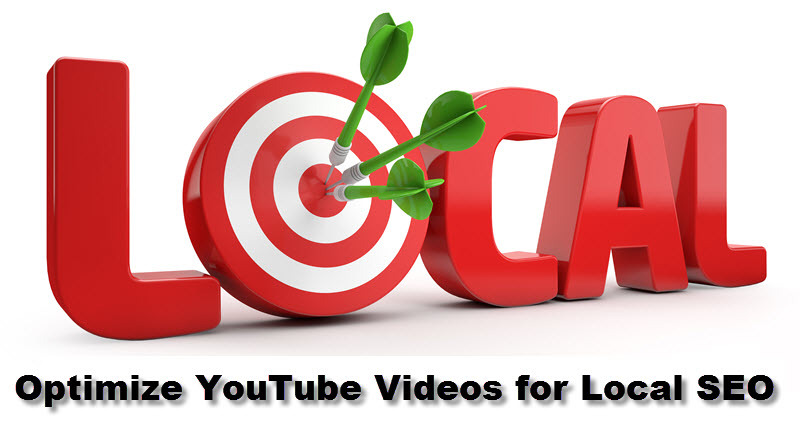 Are You Using YouTube Videos for Local SEO? If not, it’s time to jump on the bandwagon and maximize your exposure online. If you’d like to see test your website’s SEO, fill out the Free SEO Report Card Score form. In the field that asks for your main keyword, be sure to add your location information. ← Marketing Differentiation: Are You Making This Mistake?